Royal Mail's Stamp Programme mini-calendar lists some definitives and Faststamps as well as the expected commemorative issues. The Union flag could be very useful for the Diamond Jubilee and the Olympics. 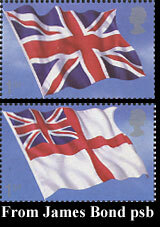 Maybe other flags will follow with a White Ensign Post and Go machine at Portsmouth and Chatham Historic Dockyard!